This is a collective band featuring John Tchicai and Charlie Kohlhase on saxophones, Garrison Fewell on guitar and percussion, Cecil McBee on bass and Billy Hart on drums. Recorded live at Birdland in 2007, “Tribal Ghost” opens the album with light horns and guitar floating over a subtle bed of bass and drums. There is low sounding tenor saxophone with a nice gritty sound playing over the undercurrent of the other saxophone, before both of the saxes gain momentum and reach forth. Fewell develops a slow building guitar opening to “The Queen of Ra” that reminds me of the opening of of “Shhh>Peaceful” by Miles Davis. Light bass and drums move in, with pinched alto and tenor saxophones harmonizing and weaving textures. Stuttering blasts of nasal sounding alto and tenor come in with coiled power, playing in stark relief with minimal accompaniment of bowed bass. On “Dark Matter” sombre horns and guitar weave through the music over patient and thoughtful bass and drums, while “Llanto del Indio” ends this live concert with a slow and mysterious opening for guitar and horns, harmonizing in a spectral and haunted manner. Horns move around each other like a double helix, with subtle guitar accents coloring the music further. The album features very light percussion by Billy Hart who plays in a very subtle and shape shifting manner. Fewell has an appealing tone, moving through and weaving in and out if the music. Tchicai and Kohlhase play at a slow burn throughout and the mystical - spiritual - incantatory vibe suits the music well. This is a fine collective album, quiet and thoughtful, played at a summering level which allows space for all voices to be heard, it's a cooperative group where no one dominates. 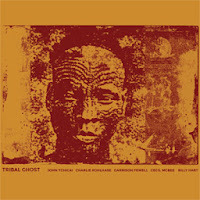 Tribal Ghost - NoBusiness Records.